Most news contains sports features/stories. Sports features contain a lead and the body. Most sports writers have a love of sports along with a strong knowledge of sports and athletes. Sports features capture the emotions of their readers. A good sports writer helps the reader visualize the event and make them feel like they were almost there. After all, a good sports feature often has a reader reading the feature twice! 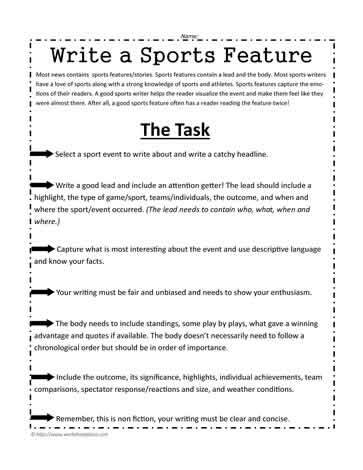 Select a sport event to write about and write a catchy headline. Capture what is most interesting about the event and use descriptive language and know your facts. Your writing must be fair and unbiased and needs to show your enthusiasm. chronological order but should be in order of importance. Include the outcome, its significance, highlights, individual achievements, team comparisons, spectator response/reactions and size, and weather conditions. Remember, this is non fiction, your writing must be clear and concise.